TPP and his academic alter ego get lots of requests for plant identifications. Sometimes you get the actual plant, sometimes you get just a picture. But thanks to Eric for calling attention to this picture from a newspaper article. The article was about the penguin, but Eric wanted to know what the unmentioned plant was. 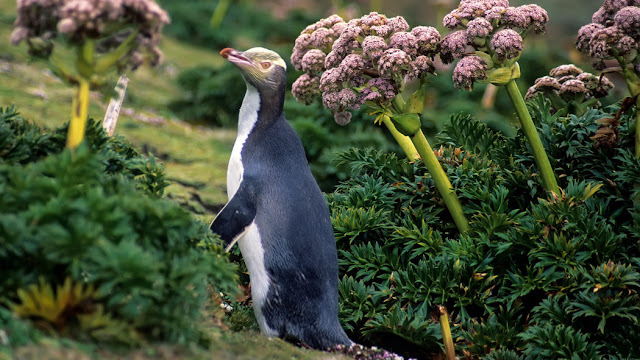 Typical example of plant blindness; a penguin, obviously, but no mention of a pretty nifty looking plant. So TPP gets the picture and that the penguin is from New Zealand. The critical piece of information is from the picture. The plant is obviously an umbellifer, a member of the parsley/carrot family. So some googling on NZ and the family name got us an image that provides a tentative ID: Anisotome latifolia, Campbell Island Carrot. It's a pretty spectacular plant, so thanks Eric for giving us a challenge. If this ID turns out to be in error, let us know. There might be several similar species. Oh, yeah, don't eat this "carrot"; umbellifers are bad bets for being edible. Great plant; cute penguin.